Getting more dark, leafy greens into my diet always seems to be a concern. Kale is so good for you, but sometimes is so not fun to eat. 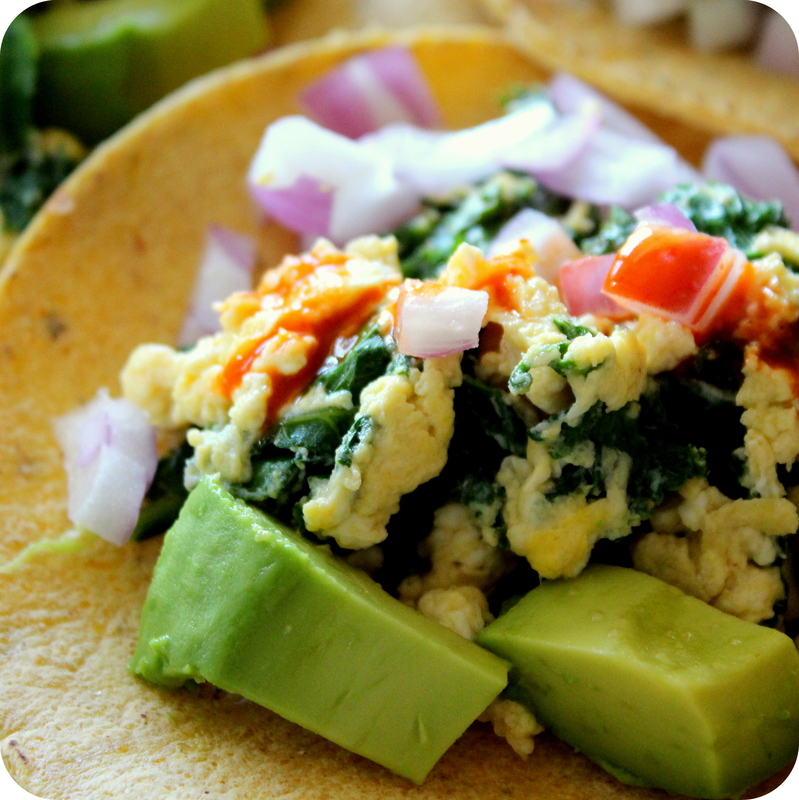 Disguising it by making kale chips, or smothering it in avocado are all fine and good, but my favorite way is to make scrambled eggs with a healthy serving of kale, which happen to be delicious when wrapped in warm corn tortillas. There have been many variations of these eggs that have come out of my kitchen over the last few years. For example, if I have extra olives, artichokes, or feta left over, those are definitely going in and I will toast up some Udi’s Multigrain bread to serve along side. If I have an open jar of salsa or pico de gallo, some bell peppers or jalapenos around, you can bet I will make making tacos. And boy oh boy, these are some good tacos. Can be made for any meal, but you will usually find me having these after a long run on a Saturday morning or as a quick dinner during the week. 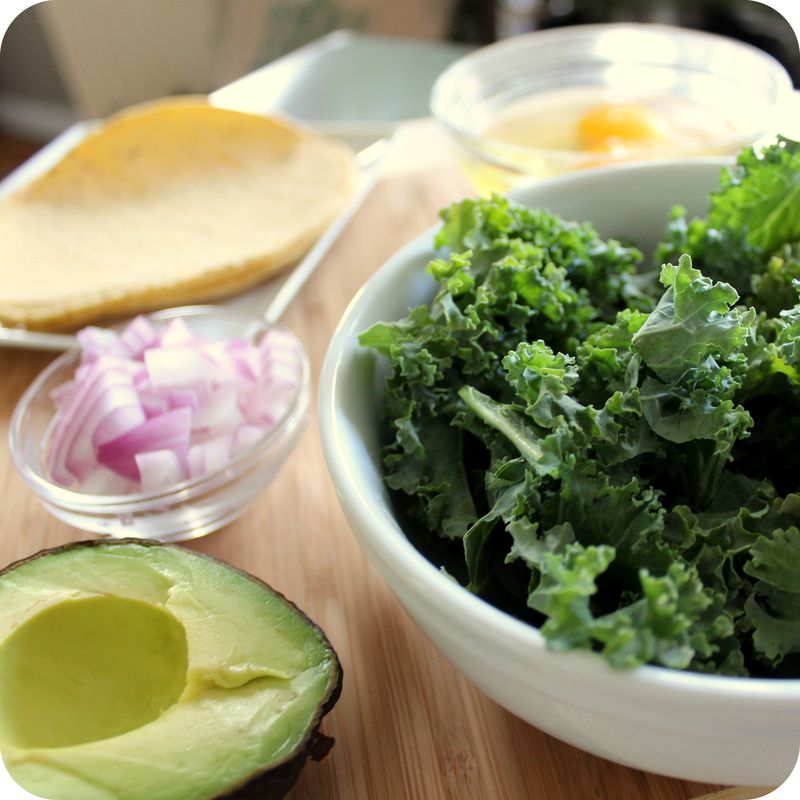 I use two eggs per serving, but definitely play with the ratio or kale to eggs. I like a lot of kale to my eggs, but this could easily be made with less kale or three eggs white for a lighter alternative. Another option is to spring a little Chihuahua cheese or queso fresco on top or a dollop of sour cream. In a small bowl, whisk the eggs, almond milk, a bit of salt and pepper, and a few dashes of hot sauce together, and set aside. In a sauté pan, heat up the olive oil over medium heat. Take a paper towel and squeeze the remaining water, if any, off the rinsed kale. Once dry, add to the pan and sauté for about 3 minutes, until the kale is darker in color, but not browning. Add the eggs and stir until eggs are cooked, and combined with the kale, about another 3-4 minutes. Place on a plate, and return the pan to the stove. Heat the tortillas in the pan, flipping a few times, until warmed through. Or heat in the microwave. Once the tortillas are done, put on a plate and assemble the tacos. 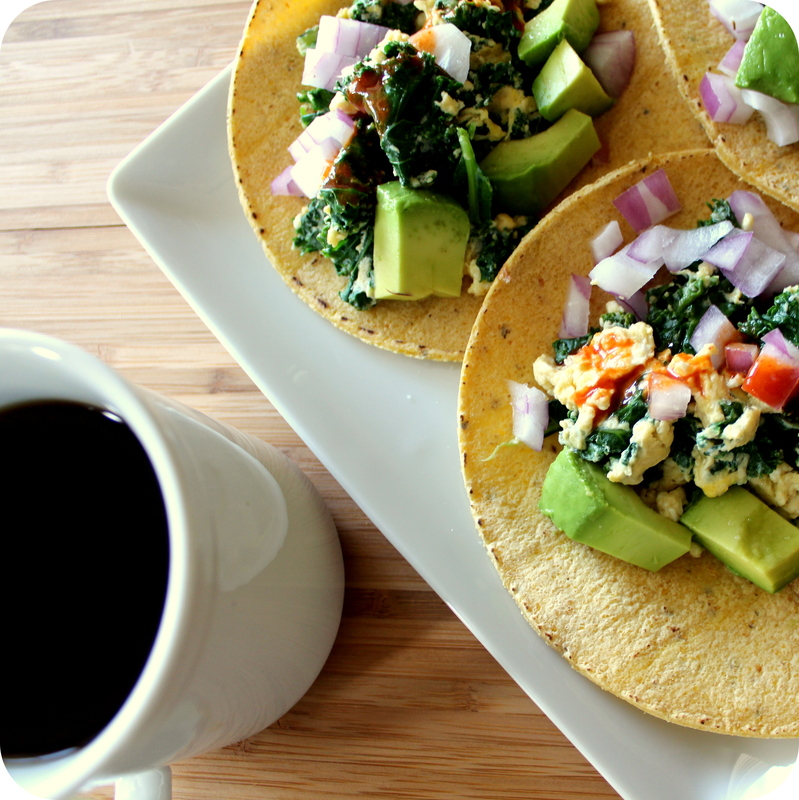 Place equals amounts of the eggs and kale, avocado, and red onion to each taco. Sprinkle with a touch of salt and top with hot sauce or cheese.